I think it's fine... She's supposed to look surprised.. and that's what she looks like. So guys, I ripped the video for you from Disney's official home page as good as it was possible for me. Enjoy. Thank you so much! Is it possible to upload the previous sneak peek too? The one that introduces the "colorful characters"? anybody else notice that the shot of the tower from the old teaser was changed to night? So...Yeah. I said it was random. It really makes me want to see the movie even more! I have been following this project since it was still called Rapunzel Unbraided, so I am glad it it finally releasing. I am also very happy Menken is writing the music for this film. I am a huge fan of his music. I also hope Gothel won't dissapoint me. I have really high hopes for her, since they didn't really show her that much. I like Rapunzel's design a little more each day too, I have come to actually like her dress even though I still hate those hideous stripped puffy and tight peach-pink sleeves... but the hair... THE HAIR...com'on !!!! I so don't like the fact that it makes the same movement as a snake when laying flat on the floor - it SHOULD be all over the place !!!! The one time I liked her hair was during the ''Let down your hair'' bit during the trailer - now THAT looked like real hair. Check it again! They uploaded a new sneak preview with new scenes and (finally) Mother Gothel. Thank you thank you thank you! So funny!!!!!! Even the parts I've seen many, many times are still funny! Woo-hoo! Now that "trailer" is way better than the previous ones!! would anyone here hope that tangled has a choral ending? i love disney choral endings. do you still wait for me Dream Giver? 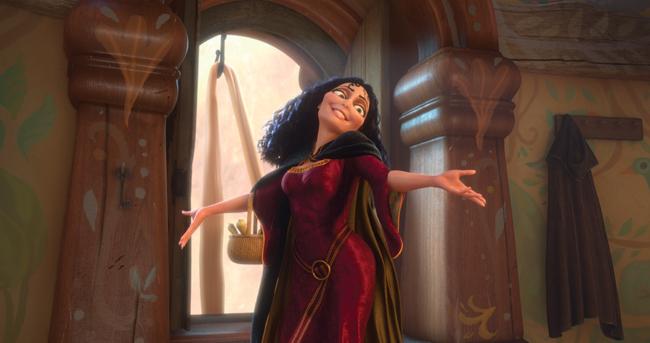 I just wanna say that perhaps they should have made Gothel more attractive. She is quite ugly for a villain obsessed with her looks. The Queen in Snow White had an icy beauty that made the audience believe her obsession with being the fairest while looking like a ruthless, menacing, and powerful villain at the same time. Wouldn't it make more sense if they had approached Gothel's design more like that? Is Gothel more into her vanity, or is she trying to keep from dying? From everything I've seen it's more likely she's trying to keep herself young forever as opposed to getting old and dying. Glad I'm not the only one! I completely agree, I'm disappointed in Gothel. She looks really weird, I don't know why though. Maybe its the eyes? Thanks so much for posting it! Is it just me or does Maximus look like he was just hit by lightning? In the interview Donna Murphy gave she says that she is hundreds of years old. Same. I think she's mostly looking into living forever. However, I do believe that she thinks that she's some what attractive, which she is. She's not the prettiest villain, but still pretty. Either that, or she just has a different sense of beauty. Not really sure if all that is true, but she's still a very interesting villain. I found an English Version of the Dutch Trailer.